The user uses Coarray in the local-view model to describe one-sided communication. In XMP, put/get communication and some synchronization functions are supported. If the target system supports Remote Direct Memory Access（RDMA） in the hardware, one-sided communication in the local-view model can achieve better performance compared to the global-view model. However, it requires more effort to describe parallel program since all communication should be specified in detail. XMP/Fortran supports Coarray in the standard Fortran 2008. Coarray in XMP/C has its own original syntax since the C language does not support Coarray. XMP/Fortran has upward compatibility with Fortran 2008. The basic unit of execution in the local-view is called “image” while it is called “node” in the global-view model. The two words have the same meaning in XMP. In XMP/C, the user declares a Coarray by adding : (Coarray dimension) after the array declaration. In XMP/Fortran, the user declares a Coarray by adding  after the array declaration. The asterisk symbol is used in both languages. Based on Fortran 2008, the Coarray should have the same size of the entire execution node group. Coarray can be accessed from other images using assignment statements. Of course, coarray can be also accessed from your image like ordinary array. When the Coarray reference appears in the left-hand side in an assignment statement, it causes put communication. The integer number in the Coarray dimension specifies the targer image. 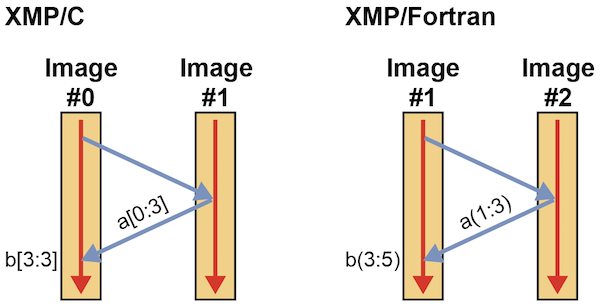 Each image index starts with 0 in XMP/C and starts with 1 in XMP/Fortran. xmpc_this_image() in XMP/C and this_image() XMP/Fortran return the current image index. In XMP/Fortran, image index starts with 1 while it uses  (similar to C style for array dimension) to specify Coarray dimension based on the standard Fortran 2008. When Coarray dimension appears on both side, 3 nodes (target, source, current node) involve the communication. In the above example, XMP/C puts b[3:3] on image 0 to a[0:3] on image 1. XMP/Fortran puts b(3:5) on image 1 to a(1:3) on image 2. The following figure illustrates the one-sided communication done by Corray. The directives in the global-view model invoke point-to-point communication. On the other hand, Coarrays in the local-view model invoke one-sided communication. When a Coarray appears in the right-hand side in the assignment statement, it causes get communication. In the above program, XMP/C gets a[0:3] from image 1 and stores them on b[3:3] of image 0. 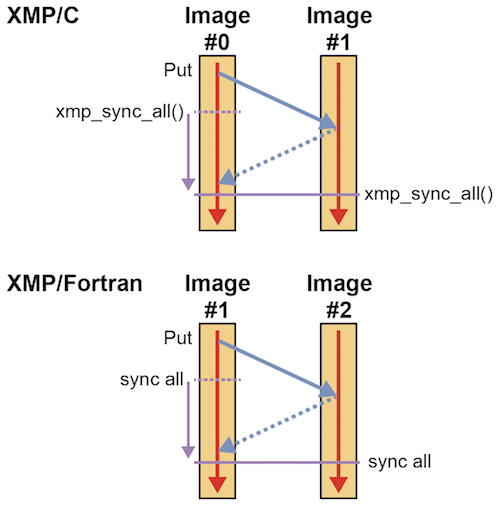 XMP/Fortran gets a(1:3) from image 2 and stores them on b(3:5) of image 1. The following figure illustrates Coarray get communication. As illustrated get needs an extra step to send a request to the target node. Put communication achieves better performance than get since there is no such extra step. Here, we introduce “sync all” which is most frequently used among Coarray synchronization functions. The “sync all” waits all issued one-sided communication and invokes barrier synchronization among the entire images. In the above example, the left image puts data to the right image and both nodes invoke sync all. When both nodes finish sync all, the execution continues after the synchronization point. Run the following sample using 2 images. In the above example, 3 Coarrays a, b, c are declared. a and b are 1-dimensional arrays and c is a 2-dimensional array. The following shows the initial values of each array. After the communication, array a has the following values. In the second get communication, in XMP/C, image 0 gets b[0:5:2] from image 1 and stores them to b[0:5:2]. In XMP/Fortran, image 1 gets b(1:10:2) from image 2 and stores them to b(1:10:2). After the communication, array b has the following values. In the put communication, in XMP/C, image 0 puts c[0:5][0:5] to on c[0:5][0:5] image 1. In XMP/Fortran, image 1 puts c(1:5,1:5) to c(1:5,1:5) on image 2. The communication has the block-strided communication pattern. After the communication, array c has the following values.